Akomawt Educational Initiative is proud to partner with other organizations and institutions. These partnerships provide opportunities to co-create impactful new learning paths combining the best of our world with the best of our partners’ worlds. Here’s some of the work we do in the region and where you can find us. The principal partners in AEI have been contributors and partners to the Upstander Academy held on the UCONN-Storrs Campus. The Upstander Academy is a 6-day transformational inquiry based professional development for secondary school educators engaging complex historical and contemporary issues related to Genocide and Human Rights. We partner with the Upstander Project, the Thomas J. Dodd Research Center at UCONN and other educators and dive deeply into the study of genocide and human rights with specific studies in the Rwandan genocide and Native genocide in the Americas. The Upstander Academy has served teachers from across the country in aiding the development of content and teaching methods that they can then use in the classroom. Alumni of the Upstander Academy come back as contributors and report on best practices. Akomawt Educational Initiative is proud to partner with our friends and colleagues for Upstander Academy 2018 and the Upstander Academy 2019! S.B. No. 452 AN ACT CONCERNING THE INCLUSION OF HOLOCAUST AND GENOCIDE EDUCATION AND AWARENESS IN THE SOCIAL STUDIES CURRICULUM. On May 10th, 2018 the Connecticut Legislature and Governor Dannel Malloy passed and signed into law S.B. No. 452 “An Act Concerning the Inclusion of Holocaust and Genocide Education and Awareness in the Social Studies Curriculum”. Akomawt Educational Initiative is proud to announce we are part of an advisory committee put together by the Connecticut Department of Education to shape the implementation of this bill. 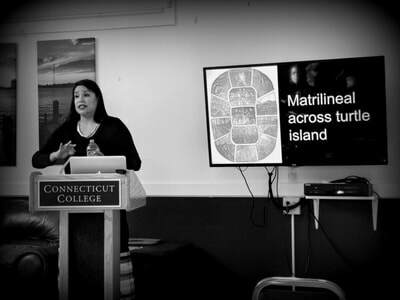 AEI’s expertise as museum educators is being utilized to provide impactful learning resources surrounding Native Genocide in the state of Connecticut. We join organizations such as Voices of Hope and many state university and secondary school educators in increasing the awareness of the complex history of genocide. Our contribution focuses mainly on the history of genocide here in our own state and region. Akomawt Educational Initiative has partnered with Connecticut College on a number of initiatives. Through our museum work we helped bring voice to the campus on issues happening in Indian Country. 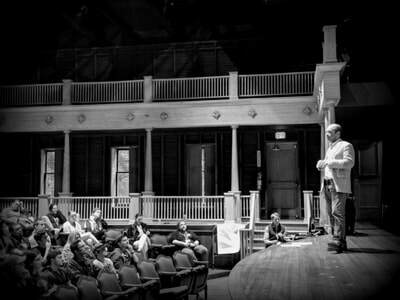 Teach-ins, panels and lectures involving Native history and contemporary issues such as Standing Rock are just some of the work we do with Connecticut College. Through our partnership we’ve also contributed to a chapter on an upcoming book about the #NODAPL movement and worked with the college on the indigenous history of the land it’s built on. This year, Connecticut College included an acknowledgement of the Indigenous history of their land and the people that occupied it for thousands of years as part of its commencement. A new tradition for the college we will continue to foster for the future. The Hole in the Wall Gang is a tremendous organization servicing the recreational needs of 20,000 sick and disabled children from Boston to Philadelphia. It was founded in the 1980’s by Paul Newman who was a frequent visitor to the camp along with many of his celebrity friends. They are a non-profit using their resources to do good in this world. The Hole in the Wall Gang Camp staff approached Akomawt about potential issues of cultural appropriaton on their campus looking for solutions on how to approach the issue in a culturally competent manner. We’re proud to say we’ve already worked with the Camp Staff on the ground level giving them an Indigenous history of the land the camp is founded on. In the near future, we look forward to bringing Native history and contemporary Native cultures to life on campus. Both organizations support our work on the Upstander Academy, but be on the lookout as we co-create with the UCONN Humanities Institute and the UCONN NEAG School of Education on upcoming projects around the concept of Re-Indigenizing History and Indigenizing Classroom Curriculum. Very exciting!